Electronic magazines can have all the drawbacks of other forms of online publishing, but they might also be a great spource of speculative fiction. Some thoughts on Fans and Fandom, and the role of Amazing Stories in the future we’re all making. A potentially deadly asteroid fall causes a Martian farmer to remember the days he spent on the red planet…and, perhaps, the days to come. A Gernsback Contest winning short story. Survivors of a doomed Earth approach the moon, not certain if the people who fled there decades earlier will view them as friends or enemies. A Gernsback Contest winning short story. A space veterinarian gets more than she bargained for when she moves – not voluntarily – to a small asteroid mining community. A Gernsback Contest winning short story. Under the best of circumstances, making art is hard. Making art on the moon with your window of opportunity quickly closing up? 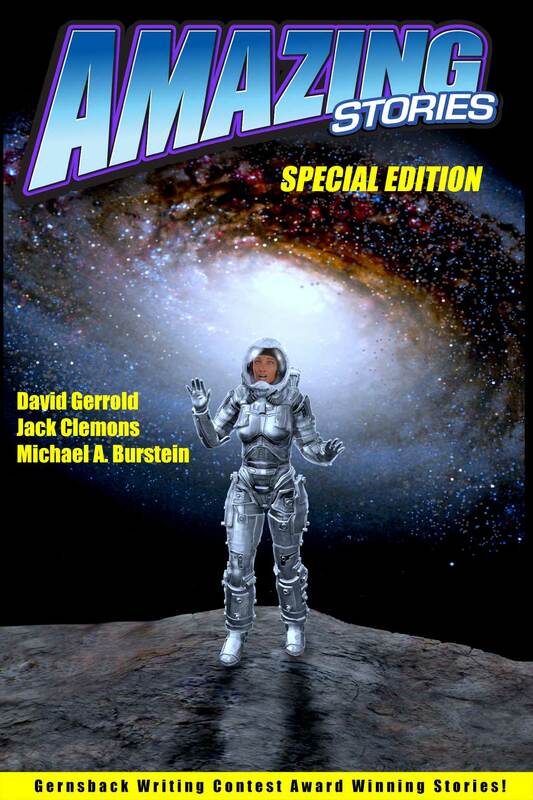 That takes a special kind of inspiration… A Gernsback Contest winning short story. Trapped in a damaged tin can floating in space, Roberto has to resort to desperate measures to survive, A Gernsback Contest winning short story. For some, the best way to deal with the apocalypse is to retreat into memory. For some of them, there is a man who can help… A Gernsback Contest winning short story. Ernie is convinced that a plume of fire holds the answers that it has been sent to Pluto to seek, but Mission Control believes that the plume is too dangerous to get near. What is a poor land rover to do? A Gernsback Contest winning short story. Mars needs a drink. Her parents try to stop her. An old story is given a futuristic twist. A Gernsback Contest winning short story. The Guardian has to protect Earth from imminent destruction by incoming meteor; the biggest obstacle to it completing its mission may be its own programming. A Gernsback Contest winning short story. Never trust an app in the form of a woman you don’t know, even if you are a hipster knight. A Gernsback Contest winning short story. The early years of fandom, and especially Worldcons, were wild and wonderful, featuring outsized personalities and innovations that are now standard features. What Does it Mean to be Amazing? Some thoughts on the meaning of the name of the first science fiction magazine.